NSU Career Day 2019 | Unipro. Reliability. Quality. Intellect. 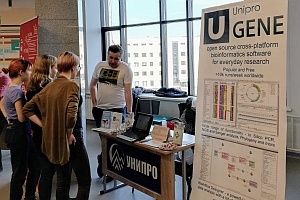 NSU Career Day 2019 – Unipro. Reliability. Quality. Intellect. It’s our first experience of attending the annual Career Day in Novosibirsk State University. We’ve got used to the fact that concerned students find us themselves, through word of mouth, or information from the NSU faculty departments, and then the most interested of them get on an internship with a subsequent diploma work. This year thanks to activities of «SibAcademSoft» Association and Career Development Center of NSU we’ve got involved into concentrated communication with students of almost all years and faculties. Stands of IT companies attracted not only “techies” from IT, math and physics faculties, but also chemists, biologists, economists and even humanities scholars. Imagine our surprise when even philosophers solved our bioinformatics quick quiz! All participants received small prizes, even for courage) We believe to satisfy the curiosity of each student who approached Unipro stand. Ahead is the annual spring meeting with students at the IT faculty of NSU.